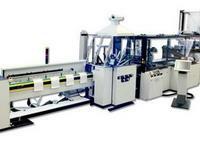 Film bag making machines are used to weld a web or a tubular of plastic film, typically PE or PP, into bags. Their construction and equipment may be very different depending on: the type of bags they need to produce, the type of handle they can apply and the way in which these bags are delivered. Unwinder 1600mm. Pneumatic shaft. Hidraulic lift. Dancer system for film speed and tension control. 4 Q inverter controlled pneumatical lifted wheel system. Edge guide system with 2 servo motors to guiding the main film to the center. 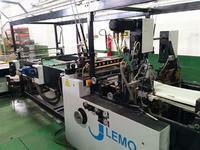 For printed or unprinted rolls with 800mm diameter. Alarms on display. Dancer limits. Inverter alarms. Additional information For courier bags . Water cooled sideweld sealing system. Servo motor control for sealing knife. 2 servo motors controlled draw rollers with Motion Control system by Mitsubishi , and tention control possibility. Automatically PLC controlled, speed & tension system new type with special rilled aluminium rollers without potentiometer adjustment automatically adjusting with PLC . Unwinder pouch film :: 400mm max width. Pneumatic shaft. Dancer system for film speed and tension control. Max diam 600mm. Alarms on display. Longitudinal sealing unit. 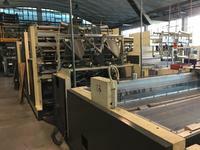 Folding unit 1600mm width. Glue unit (Robatech) Wicketer servo motor controlled 8 arms with 2 vacuum pumps. Servo motor controlled pinn positioning system. Servo motor controlled sycronised following system for the wicket unit. 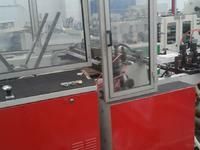 Total 10 servo motors & motion control system. Material HDPE, MDPE, LDPE films. Film thickness min 2x 25, max 2 x 100 my.